A Puerto Vallarta honeymoon features beaches, Havana-style nightclubs, beautiful natural scenery and plenty of activities and amenities. Puerto Vallarta is a resort town along the Pacific coast of Mexico. Puerto Vallarta honeymooners are drawn here for the beautiful beaches, many opportunities for water sports and the raucous party scene. The city center has a small-town feel and features cobblestone streets, an ornate cathedral, boutique shopping and a number of restaurants, clubs and bars. The town has a very well-developed tourist infrastructure with a number of sophisticated resorts and hotels lining the beachfront as well as upscale dining options. The scenery is superb here with not only a beautiful, sophisticated oceanfront but also the Sierra Madre Mountains to the east of town. However, the town itself has much to offer, so make sure you take time to walk its streets, enjoy some delicious local food, shop the city’s unique boutiques and dance the night away in one of Puerto Vallarta’s legendary nightclubs. You'll love all that a Puerto Vallarta honeymoon has to offer. 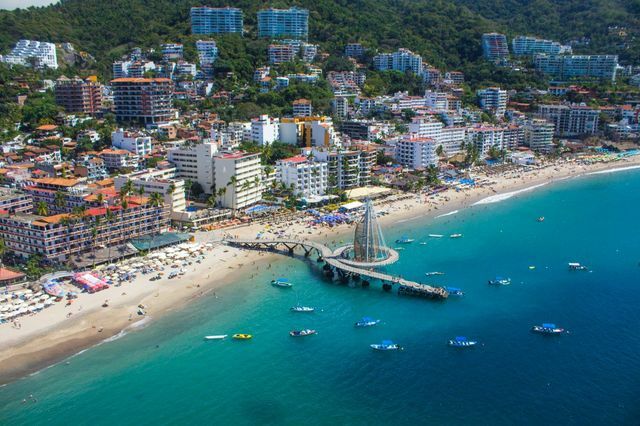 The best time for a Puerto Vallarta honeymoon is April-June when the weather is favorable and accommodations comparably affordable. Whale watching season is from January to March but this is also the time of year that Puerto Vallarta sees its most expensive prices. Islas Marietas National Park A group of small, uninhabited islands known for beaches, snorkeling and scuba diving. Las Caletas A beach with snorkeling, sea lions and zip-lining perfect for those planning an adventurous Puerto Vallarta honeymoon. Playa Camarones A relaxed, romantic beach popular for walking and watching the sunset. Los Arcos Marine Park Beautiful granite islands with stone arches and snorkeling off the coast of Puerto Vallarta. Museo del Cuale A small cultural museum with exhibits related to the history of the area. The Museo Naval A colonial-style building housing model ships and other exhibits related to Mexico’s naval history. Marigalante A large, playful pirate ship that offers sailing trips complete with costumed guides—fun for an offbeat Puerto Vallarta honeymoon. Aquaventuras Park A large water park with thrilling water slides, play features and a chance to swim with dolphins. Mirador Cerro de La Cruz An observation deck with panoramic views accessed by climbing steep steps. Galleria Dante An enduring local art gallery housed in a hacienda-style villa. Mundo Nogalito An adventure park with activities such as hiking, zip-lining, and tequila tastings. Los Arcos Iconic seaside arches and amphitheater on the oceanfront square of Plaza Moreles. Los Cabos versus Puerto Vallarta for January honeymoon?